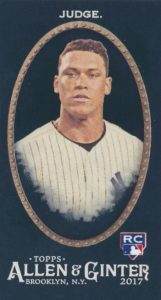 If the main A&G set is a little too much for you to process, or you just love some Ginter, 2017 Topps Allen & Ginter X Baseball might be the perfect option for you. Offering a truncated version of the offbeat release, the real obvious difference for the online-exclusive product is the black background on the cards. Using the standard 2017 Topps Allen & Ginter as a guide, the base set includes black versions of the 350-card set. There is also one black Mini per pack. 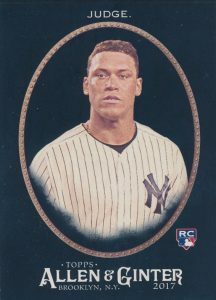 The more limited parallels include familiar Full-Size Glossy, A&G No Number Minis, Brooklyn Back Minis and Framed Mini Printing Plate (1/1) editions. Unique to the X format are Red Minis (#/5) and Silver Minis (1/1). The other cards of note in the 2017 Topps Allen & Ginter X Baseball checklist are the 100 Framed Mini Autographs inserts for baseball and non-baseball subjects. 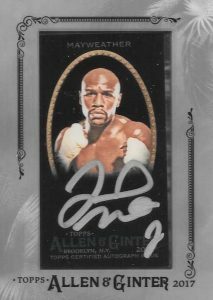 These stand out, as well, thanks to the silver frame, black mini card and on-card signature in silver ink. While most are aware of the MLB players included, check out our breakdown of the non-baseball signers for more details. 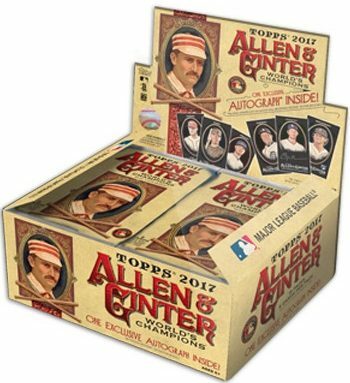 2017 Topps Allen & Ginter X Baseball came through the Topps online store. While boxes were priced at $69.99 and 12-box cases for $839.99, the supply quickly sold out. 2017 Topps Allen & Ginter X Mini Black Silver Framed Ink Auto Joe Thomas Sr. PARALLEL CARDS: Full-Size Glossy, Mini Black (1 per pack)*, No Number Mini, Brooklyn Back Mini, Red Mini #/5*, Silver Mini 1/1*, Framed Printing Plate Mini 1/1. 100 cards. Shop on eBay. 3 cards. Standard white version. 15 cards. Standard white version. 10 cards. Standard white version. 45 cards. Standard white version. Rick: This is the profile for A&G X which costs half that amount. 2017 A & G and 2017 A & G X are the same sets. Rick: Very similar, yes. X is basically a black parallel of the base set and autographs. Rich Klein of ABC news (who also has his own A&G card from last year!) hooked me up with the Jose Canseco A&G X from last year. I admit it is a bit of a strange thing though. They are making SO many different card types, it is hard to keep up with. I think I “ugh” and “YES!” in the same breath each time they come out with something else. I don’t recall how much was produced last year, but this year I think they made less than 200 cases. It is important to note that many of the mini variations are from the regular set, and not blacks. For instance, the brooklyn back appears a though it is a regular mini, not a black front mini. Red/sliver minis though, are exclusive to this set.